Ben gained his first introduction to brass bands in 1993, joining the Southern Districts Brass Band on Repiano Cornet. He quickly moved onto the front row before becoming principal cornet in 1994, a position he has also held with the Perth Fortress Band of the Salvation Army. Ben was accepted to play in the Australian Brass tour in 2001. Ben has been the Principal Cornet of the RASWA Brass since 2005. In 2003 Ben moved to England to experience top level banding in the United Kingdom and joined the Reg Vardy (Ever Ready) Band on Solo Cornet. During his time with the band, he played in all the major British brass band contests, winning the North of England Regional Championships on two occasions and gaining 3rd prizes at the National Championships of Great Britain, the All England Masters and the Brass in Concert Championships. He also participated in a CD recording and several BBC radio broadcasts with the band. 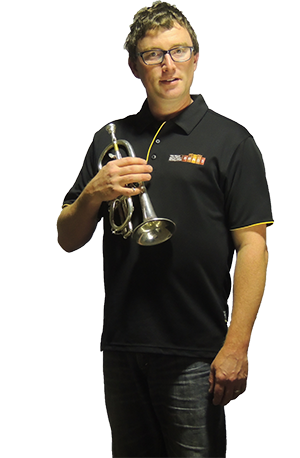 Ben’s success as a soloist includes Australian National Cornet Champion in 2010 as well as being‘A’ Grade Champion in Western Australia on cornet and flugel on numerous occasions, including Champion of Champions in 2000 and 2007-9. Ben represented Western Australia at the Ern Keller International Soloist competition in Sydney a number times. Originally from Oxford, Mike started playing at the age of 7 with the Yarnton Band and enjoyed many European tours with them. During the early 80s he joined Brackley & District, appearing with them at the Royal Albert Hall for the National Finals. 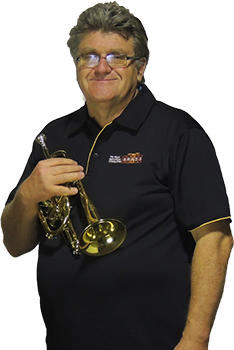 He moved to Perth in 1988 with his family and joined WA Brass (then known as the Channel Nine Brass Band) where he was principal cornet from 1990 to 2005. Mike works as a contract draftsman in the mining industry and was a member of Australian Brass when it re-formed in 1995. Playing highlights would include the Royal Albert Hall finals appearance and RASWA’s 2013 performance in the Australian Nationals. Mike has been a committee member of the band for twenty or so years and is a former Vice-President and President. 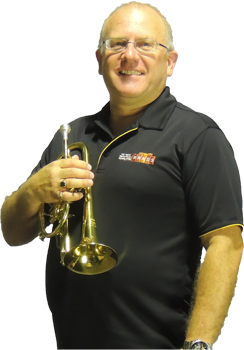 Born and raised in Adelaide, Tim graduated from the University of Adelaide with a Bachelor of Music Performance on trumpet in 1991 and with a Graduate Diploma in Education in 1993. Whilst at university he played with tertiary orchestras, brass ensembles and big bands. 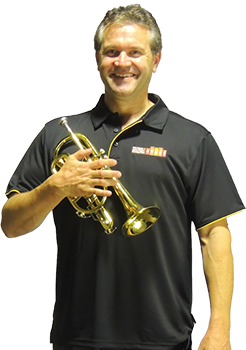 After graduating from his performance degree in classical trumpet Tim started his brass band career in 1992 as solo cornet with Elizabeth Brass Band and later in 1993 as principal cornet with Mitcham City Brass Band. He also played extensively as a casual musician with many ensembles including the Adelaide Symphony Orchestra, the radio sponsored 5AD Big Band and WASO. 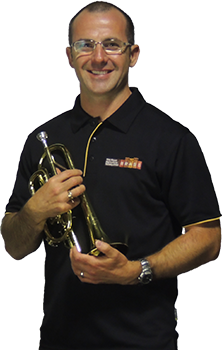 In 1995 Tim was offered the position of Head of Brass at Scotch College and moved to Perth to develop a career in music education. 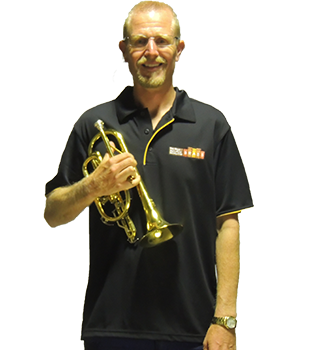 He joined RASWA (then known as Midland Brick Brass) in 1995 where he played solo cornet for 3 years. After some time away from the band Tim joined the cornet ranks in RASWA again in 2008 and has been a regular member of the band since. Away from music he enjoys watching and playing sport, mostly the round ball variety, he supports the Adelaide Crows, but is also a keen follower of WA AFL teams. Apart from this he also enjoys food, cycling and travelling! Tim started playing the trumpet when he was 8. After completing music studies throughout high school he enjoyed a very very short period at university before deciding to adopt the rock and roll lifestyle, during which time he hit a lot of drums and generally behaved like a member of Spinal Tap. Somehow through this time Tim stayed true to his brass heritage and has been a member of the band for over 20 years. Tim’s shy and withdrawn personality along with a delicate and tasteful playing style suits the soprano cornet perfectly and he vows to never try another instrument. Having now left the rock and roll life behind, Tim returned to university to study how to do things with motors, cogs, sensors and computers, and now has a semi respectable job making things whir and pop in an automatic fashion. When not performing with the band, Tim enjoys the company of his wife and daughters and dreaming of things he hopes to one day build with his late collection of timber and power tools. I currently play Repiano cornet for RASWA and have been playing with the band since 1991. All though my mum thought it would be good idea to play drums when I was 7 years old due to having severe asthma. I wanted to play the same instrument as my sister the cornet. I finally got my way and despite playing in various bands I have always played in the same bands as my sister Nina (Brotherton). Glenn is a manager for an Energy company and have been kept busy with a teenage son who plays cornet/Trumpet as well. What time I have left I love to goto the gym and running. Laurie was born in Broken Hill (NSW) and grew up in Adelaide in the suburb of Largs Bay right in the heart of Port Power country. As a boy Laurie dreamed of playing football for Port Adelaide but had his footy career tragically cut short by a lack of ability. He attended Flinders University and headed to Tasmania when he completed his studies. Laurie worked as a Probation and Parole Officer supervising and counselling people on court orders. Laurie again tried resurrecting his football career but this was short lived as he found himself playing against people he was supervising on probation and parole, and decided that it was safer for his health to play squash. Whilst in Tasmania Laurie completed study at the University of Tasmania in music performance with plans to be a professional musician but again his plan were tragically cut short by a lack of musicality. He then changed direction and completed a Diploma of Teaching. Laurie has worked as teacher and educator since completing the diploma in Western Australia. He now spends his time dreaming of playing in a professional orchestra whilst playing 2nd trumpet in the junior concert band at his present school. Elly started playing cornet when she was 7 and she has been making loud noises ever since! Elly grew up in Bath in the UK, and played in the local brass and youth brass band, with whom she played in the National Youth Brass Band Finals which was very exciting on many levels, not least because she had never been as far north as Birmingham before which was where the finals were held (Note: Birmingham is only 2 hours from Bath and is in the middle of England, so not very north…)! Elly then decided to venture further north to Leeds (4 hours north of Bath) where she studied music and enjoyed playing in lots of ensembles, including Jazz, Orchestras and Brass Bands. She loved the Yorkshire Brass Band scene and played with Grange Moor and then Knottingley Silver Brass Band who she went to the national finals with! Elly moved to Perth in 2016 and is loving playing with the band and all the fun and interesting opportunities that arise as a band member! Kayla grew up in a small country town in Victoria, and joined the Portland Citizens Brass Band in 2003 on cornet. She quickly moved onto the soprano cornet which she continued to play until she joined the Marion City Band on Bb and Eb cornet in adelaide in 2014. 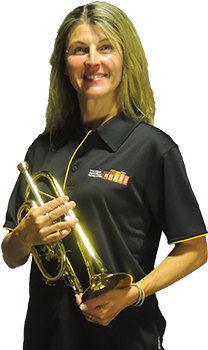 She has competed in both band and solo competitions at state and national levels and was the winner of the Adelaide Slow Melody championship for 3 out of 4 years on Bb cornet. Kayla moved to Perth in early 2017 to expand her nursing career and spend more time with her family.